The 135 CSX is one of the upright bike models released by ProForm in 2015, however, it’s still available. 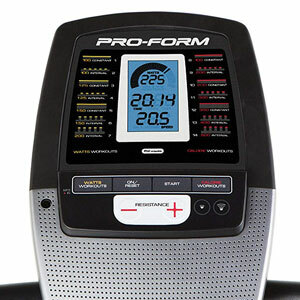 It’s one of the most affordable ProForm upright bikes, currently priced under the mark of $200. 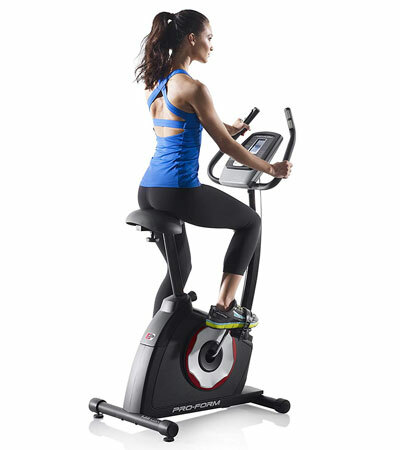 It’s also one of the most affordable upright bikes with a digital (eddy current) resistant control, while its console offers a pretty consistent set of workout programs. For reference, this is the ProForm part number PFEX51915. Although it’s a rather affordable exercise bike, the ProForm 135 CSX features a durable steel frame, which can support users up to 250 lbs (113.3 kg). It’s made of a combination of ovalized and cylindrical bars, while the covers of the flywheel, resistance system, and other internal parts are made of a solid ABS material. The core frame of the bike is one-piece; you only have to attach the base bars, the seat bar, and the console mast to it. All the steel parts in the bike’s frame are double-coated with a corrosion-resistant and scratch-resistant paint. The color used is black, with the ProForm logo painted white/red. The fully assembled bike is not extremely heavy. It weighs approx. 74 lbs (33.5 kg); thus, it’s assembly and transport should be easy to carry out by one person. Plus, the front base of the bike features rotating caps which can serve as transport wheels for the assembled unit. The bike offers an excellent stability as well. Its rear base is equipped with a set of adjustable levelers with rubber pads which give you the possibility to perfectly stabilize the unit on any type of floor. One last aspect to mention here regards the unit’s assembled dimensions. 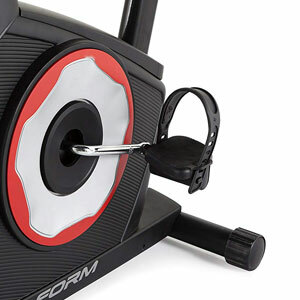 This ProForm exercise bike is far from being a large fitness machine. It’s approx. 35″ (89 cm) long, and 23″ (59 cm) wide, while the top of the handlebar reaches a height of approx. 55″ (140 cm). This being said, the unit can fit pretty well even into a smaller room. But it is recommended to leave at least two feet of clearance on its sides for ease of access to the seat, and safe operation. 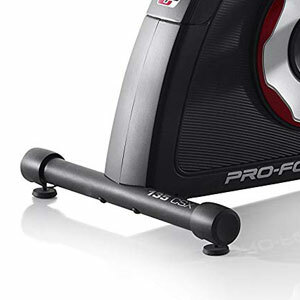 The ProForm 135 CSX upright bike includes a fairly large saddle. Its exact dimensions are not specified, but as a general idea, it’s considerably larger than the average slim spin seat. It also integrates a layer of padding, while its surface is contoured, so it provides an optimal level of comfort. The seat is 4-way adjustable (up, down, front, back). Its upright bar has multiple height adjustment holes, while the small horizontal slider also provides a few inches of forward-back adjustment. Differently put, the bike should be able to accommodate comfortably users between 5’2″ and 6’3″ (157 – 190 cm). 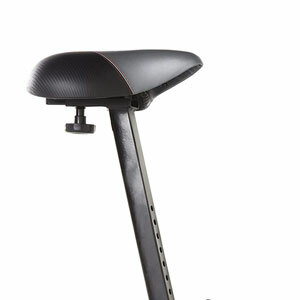 Also, the seat assembly is durable enough to support users up to 250 lbs (113 kg). The bike’s handlebars are non-adjustable. As opposed to the handlebars on the Kettler E3, for example, they are directly attached to the console mast via several screws, so their angle cannot be adjusted. This shouldn’t be an inconvenience, though, as they have a multi-grip design. They also incorporate pulse sensors and they’re fully covered by a sheet of high-density foam material for extra comfort and a secure grip. The first drive element that we’re going to address here is the flywheel. The ProForm 135 CSX is equipped with a 12 lbs (5.4 kg) flywheel which is balanced and produces a very steady and smooth pedaling motion. Since it’s not very heavy, it doesn’t provide a very aggressive inertia so the bike is great for recovery training, or for elderly users. It’s also bi-directional, which means you can pedal in reverse if you want. However, coasting is not possible; the pedals continue to spin for as long as the internal flywheel is spinning. The 135 CSX features a durable pulley system and steel crank arms. The pedals are made of nylon material but have a metallic core. They have a weighted design, which means they will turn face-up when you remove your feet from them. They also have adjustable straps so you can perfectly secure your feet on them. An important aspect to mention with regards to the bike’s crankset and pedals is that they are not made for spin workouts, or standing up pedaling. Even though they may hold users up to a certain weight with no problem, workouts of this sort are not recommended as they may lead to damage to the internal parts. The bike uses a poly-v belt for its transmission. This belt drive comes with a series of advantages. To begin with, the pedaling motion is almost silent. The belt doesn’t require lubrication. Also, there is less vibration generated during pedaling than for a chain drive. The ProForm CSX 135 features an eddy current resistance system with digital resistance adjustment. In other words, the resistance can only be controlled from the console, and the internal resistance parts are a small servo motor and a magnetic brake. As you select a certain resistance level from the console, the motor will adjust the position of the magnetic brake in order to increase or decrease the intensity of the internal magnetic field, and this way the bike’s resistance. As we’ve mentioned above, the bike has several preset workout programs. Therefore, if you decide to use one of these programs to exercise, the bike will auto-adjust the pedal resistance. The console requires 4 D-type batteries to function (which are not included). There is also the option of a power adapter (also not included). The bike offers 16 levels of resistance. The first few levels are very light, perfect for recovery training. The top 15-16 levels, however, offer quite a bit of resistance, allowing you to achieve a higher heart rate in a shorter period of time, and a more intense burn for the leg muscles. The ProForm 135 CSX features a console fairly similar to the 235 CSX recumbent bike. However, it only has 14 workout programs, divided into two categories: Watts Workouts and Calorie Workouts. Although these programs are pre-set, you can still make your own adjustments to them. The console itself features an LCD display with pretty large, easy-to-read digits, split into three main sections. The top section indicates speed in revolutions per minute (RPM), the power output in watts, and your heart rate when you use the handlebar sensors. It also shows the resistance level for a few seconds when you change it. The display shows each one of these metrics for several seconds. The center section of the display indicates distance and time. The distance can be set either in metric or imperial units. Also, if a goal value is set for time, the display will show the time remaining for reaching that target instead of the elapsed time. These two metrics will be shown alternatively, each one for a few seconds. The bottom section of the display shows pedaling speed and calories burned. Again, you can set up the unit to show the speed in either metric units (km/h), or imperial units (mph). Just as for the middle and top section of the display, the speed and calories metrics will be alternated, each one being shown for a few seconds. Apart from the fitness-oriented features, the console also integrates two extras. One is the sound system, the other is the tablet holder. The sound system consists of two small speakers placed on the bottom of the unit. There’s an audio jack input on the console and controls for sound volume. The unit is compatible with most smartphones, tablets, or MP3 players. The tablet holder is placed above the unit’s controls. It can accommodate most tablets or phones. However, a tablet placed on it will cover the console display at least partially. The bike’s internal parts are already assembled and attached to the main frame. Therefore, all you have to do for assembly is attach the base stabilizers, the seat post, the seat, the console mast, the console and the pedals. This shouldn’t take more than an hour. Basic tools for assembly are included, and the manual provides very clear assembly instructions. For maintenance, you only have to check the bike for any loose bolts and parts from time to time and remove the dust from it. The internal parts don’t require lubrication or any other maintenance, at least not for a few years of use. 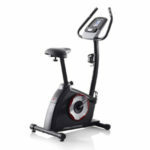 The ProForm 135 CSX is a mid-range upright bike featuring an automatic magnetic resistance system with 16 tension levels and a console with 14 preset workout programs. It’s equipped with a comfortable, 4-way adjustable seat. It’s sturdy enough to support users up to 250 lbs. It’s great for light to medium intensity cardio workouts, weight loss, stamina development, recovery training, and muscle toning. It’s also one of the most affordable recumbent bikes with a motorized magnetic resistance system.